"Deaths: In 14 clinical trials, 5 deaths were reported among 8,088 (0.06%) recipients of PEDIARIX and 1 death was reported among 2,287 (0.04%) recipients of comparator vaccines. Causes of death in the group that received PEDIARIX included 2 cases of Sudden Infant Death Syndrome (SIDS) and one case of each of the following: convulsive disorder, congenital immunodeficiency with sepsis, and neuroblastoma. One case of SIDS was reported in the comparator group. The rate of SIDS among all recipients of PEDIARIX across the 14 trials was 0.25/1,000. The rate of SIDS observed for recipients of PEDIARIX in the German safety study was 0.2/1,000 infants (reported rate of SIDS in Germany in the latter part of the 1990s was 0.7/1,000 newborns). The reported rate of SIDS in the United States from 1990 to 1994 was 1.2/1,000 live births. By chance alone, some cases of SIDS can be expected to follow receipt of pertussis-containing vaccines." Note that vaccines were introduced in the late 1940s through the late 1960s. 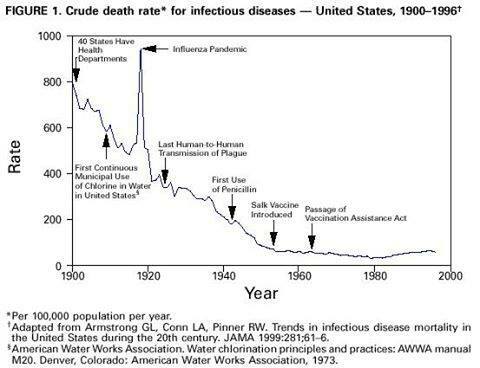 This is after the death rate from infectious diseases had bottomed out. Many more were added to the recommended schedule beginning in 1989 after congress absolved manufacturers of liability. "From the first human vaccines developed two centuries ago, smallpox and rabies vaccines, death has always been a complication of vaccination. In 1933, the whole cell pertussis vaccine’s ability to kill without warning was first reported in the medical literature when two infants died within minutes of a pertussis shot. In 1946, American doctors detailed the sudden deaths of twins within 24 hours of their second diphtheria-pertussis shot. In 1986, the U.S. Congress passed the National Childhood Vaccine Injury Act and has awarded over $2 billion dollars in compensation for deaths and injuries caused by vaccines."